The Nokia 603 was officially announced last October 2011. 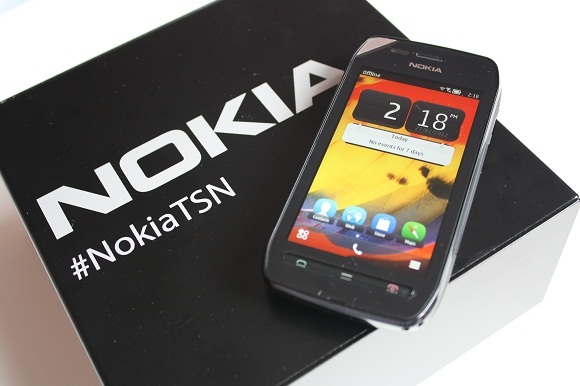 It is one of the first Symbian devices that feature the latest Nokia Belle software version. It has a very youthful looking design. It also comes with two (2) interchangeable back cover. It is priced at a mid-range phone. One of the best features of this device would be the NFC. NFC is a much faster way of connecting your device to other NFC enable handsets and accessories. You can connect by just tapping both the NFC enabled devices and they would easily pair using Bluetooth. Primary Camera 5MP, Fix Focus, 720p video. The Nokia 603 as I said before has a very youthful design. It is the best designed Symbian Bell device. It has a very nice feel on your hand. It fits perfectly. The curved back contours on your hand for a better grip. The back cover has a nice feel to it. The three (3) function keys are very responsive. All the function keys are all lay out very nicely. On the top of the device you’ll find the lock key instead of the on/off, the 3.5 mm headphone jack, and the USB port. There is no port on the bottom, and on the right side you’ll find the volume key and camera shortcut. At the back of the device you’ll see the 5MP camera without flash and the loud speaker. With the 3.5” screen display you can easily touch all the corners of the screen. My only problem with this device would be the volume and camera key. They are not what you call soft; rather you need super powers to press them properly. It has a 1GHz processor, so it can handle multitasking. I did open up 25 apps at the same time, and the performance didn’t change a thing. When I tried to open the 26th it says memory full so I stop. When you put side by side the Nokia 603 and Nokia N8 which has 680MHz processor, you won’t notice much difference in performance. But then when it comes to handling apps, you’ll start to notice the difference. There’s a myth in photography that a bigger megapixel means better pictures. Well that’s not true. This is very evident on the Nokia 603. It only has 5MP camera and yet it can take stunning photos. It has a very fast shutter speed, which would allow you to capture a lot faster compared to other phones. It’s good at taking photos even at low light. It doesn’t have flash though but its ok since LED flash isn’t really good at all. It has a fix focus so you can never do a macro shot. I have tried the Nokia N9, and I can say that the 603 can take better photos. The Nokia N9 has an 8MP camera. The only thing that I hate on the 603 camera is the camera shutter key. It is really really hard to press. Sometimes I miss my subject just because I can’t press the key properly. That’s why I don’t use the camera key anymore. Having a 5MP camera has a downfall and in this camera, it’s the details. When you zoom on the photo, the detail isn’t really good. The Symbian Belle is the best Symbian OS so far. It is an updated version of Symbian Anna. It is also one of the most waited Symbian update. Symbian Belle offers a much smoother interface, a new layout, a better design, and lots of performance improvement. It is also packed with new widgets and now instead of three (3) home screens you’ll have six (6). The new widget offer better information about your apps, and it is also has a better design. You can also now freely move your widgets to any place you want, unlike in the Symbian Anna which is very limited. The Symbian Belle also offers more efficient RAM management. So I think the question now is, is it worth it? For me it would be a yes. The Nokia 603 offers a better performance with its 1GHz processor. A better OS with Symbian Belle and my favorite, the awesome 5MP camera. The design of the device is also a looker. At the price of $275 USD before VAT you are getting a lot of features from this phone. Not to mention it is NFC enable device. It is best paired with the Luna Headphone which is also an NFC enable headphone.